We went to the National Mall today to visit the Smithsonian museums, so I didn’t get my bird walk in. Still, I managed to see lots of sparrows and starlings—and even a (probable) red-shouldered hawk diving toward trees alongside the National Museum of American History. However, it was so unbearably windy that I didn’t bother taking my camera out to photograph any of these subjects, because that would mean switching from ski gloves to knit gloves, and my fingers would feel like falling off in about two seconds. There are only so many sacrifices I’ll make for a picture. I got to see lots of birds inside the National Museum of Natural History, though. They weren’t alive, but I got to learn things one might miss on a walk through the woods. 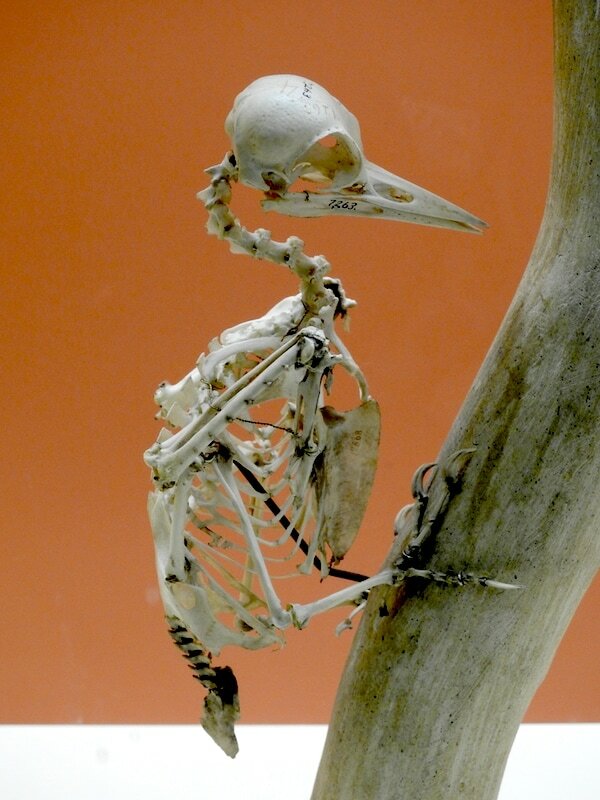 The members of the Order Piciformes have toes arranged in pairs, free thoracic (chest) vertebrae, and varied palates. All but the woodpeckers are primarily perching birds. The large-billed toucans are fruit-eaters; other groups eat insects, and the honey-guides digest the wax taken with honey from the comb. What’s the bit about “free thoracic … vertebrae,” though? In lots of birds, the bones of the upper spine are fused together to provide stability for the wings during flight. These fused bones are called the notarium. 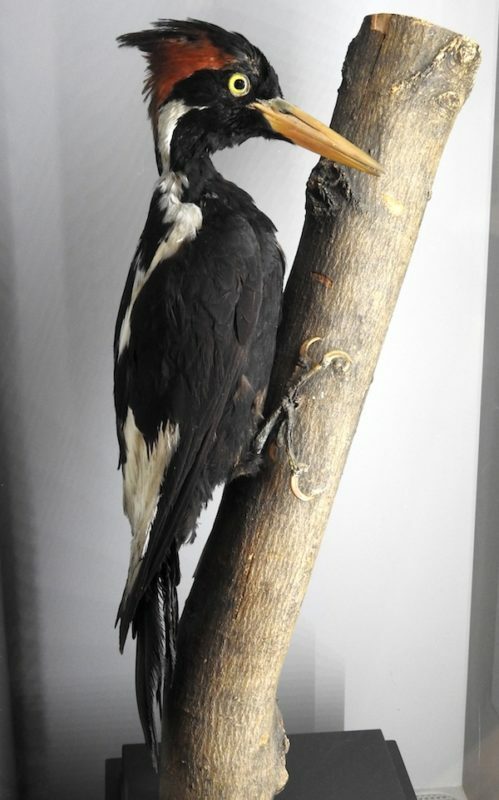 Next door in The Last American Dinosaurs, a display on extinction included a stuffed male ivory-billed woodpecker (Campephilus principalis), a species last definitively seen in the wild in 1944. It was from this part of the country, frequenting old-growth forests in the Southeast. Ivory-billed woodpeckers had the same mohawk hairstyle as the pileated woodpecker, but were larger and had different coloring. The red head plumage means this individual was male. Females had black feathers on their crowns. The ivory-bill vanished some 60 years ago, along with much of the old-growth forests where it flourished. One of the largest woodpeckers in the world, it has become a legendary symbol of the country’s lost woodlands. Since the U.S. had no endangered species act at the time, Singer was free to destroy an important part of our national heritage just because it felt like it. So it did. There have been reports of possible ivory-bill sightings in Louisiana, Arkansas, and Florida in recent decades, but nothing definitive. It’s depressing, but it makes me appreciate the woodpeckers I see on my daily walks even more—even when they’re being loudly obnoxious and scaring all the other birds from the feeder.